In 1770 Philadelphia merchant John Cadwalader and his wife Elizabeth, a wealthy Maryland heiress, commissioned five family portraits for their Second Street house. They chose artist Charles Willson Peale, who had recently returned from training with renowned history painter Benjamin West in London. The centerpiece of the series was this conversation piece in which the sitters engage with each other rather than the viewer—the latest fashion in grand manner British portraiture. 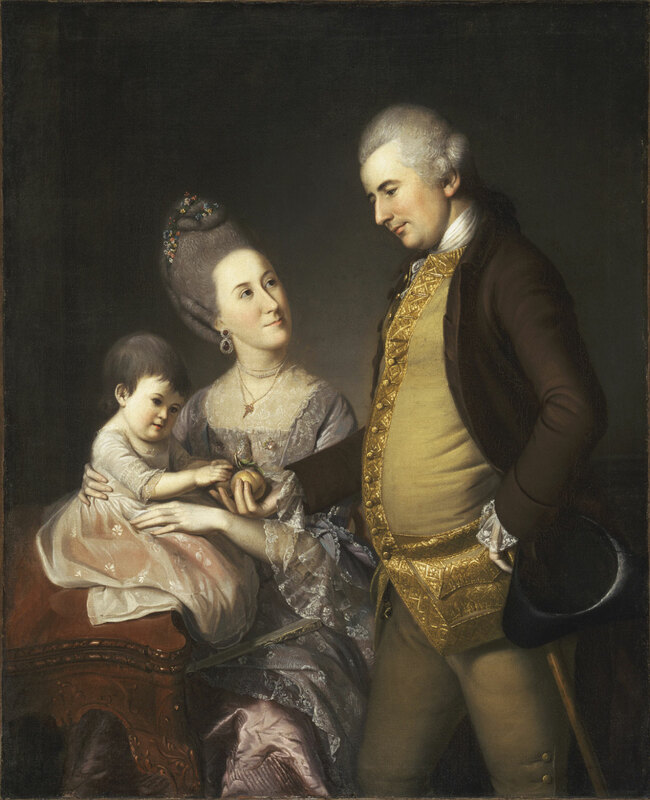 Successful Philadelphia merchant John Cadwalader, holding his hat and walking stick at his side, gently offers a ripe peach, a symbol of honor and virtue, to his firstborn child, Anne, while his wife, Maryland heiress Elizabeth Lloyd, gazes at him affectionately. In 1770 Cadwalader commissioned five family portraits, including this one, from Charles Willson Peale to adorn the sumptuous parlor of his new Philadelphia town house. Peale took great care in describing the luxurious fabrics, jewelry, and carved Rococo-style furniture (left) that were among the family’s possessions. Carol Soltis, from Philadelphia Museum of Art: Handbook. Philadelphia: Philadelphia Museum of Art, 2014, p. 266. Like Thomas Eakins, Charles Willson Peale is inextricably linked with Philadelphia, yet the young artist was living in his native Maryland in 1770 when John Cadwalader's commission for family portraits allowed him to test the market for his talents in the city. Cadwalader's order for five large portraits in elaborately carved and gilded frames, to be hung in the house on Second Street that he was renovating and furnishing in grand style, was unique in colonial America, and Peale rose to the occasion, applying all he had learned about stylish portraiture from Benjamin West in London. This portrait of the Cadwalader family is clearly the centerpiece of the group, and the artist has detailed the gold embroidery on Cadwalader's waistcoat, Elizabeth Cadwalader's large jeweled earring, and the serpentine-front card table--part of an outstanding suite of American rococo furniture (see side chair)--to express the young couple's affluence and taste. The affection and pleasure of family life that animate the scene are unique to Peale in eighteenth-century American painting, and reflect the artist's profoundest feelings about his own growing family. Darrel Sewell, from Philadelphia Museum of Art: Handbook of the Collections (1995), p. 261.